The Liberal Chamber of Commerce once again sponsored the New Educators Breakfast on Thursday morning at 6:45am at SCCC/ATS. 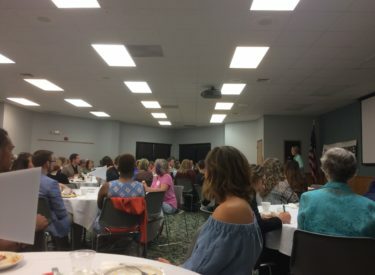 After welcomes were made by Rozelle Webb, Chamber Director, Holli Horyna, Education Committee of the Chamber of Commerce, USD 480 Superintendent Renae Hickert, and SCCC/ATS Vice President Dr. Todd Carter , over 90 new educators were introduced to a capacity room, by their host businesses. Teachers new to the District and the college have come from as far awawy as California, New York, and all points in between. Most teachers have been in the community for several weeks already with classes starting as early as Friday.